Hawick Councillor Davie Paterson on Parkdail (A7). Dangerous pavements south of Hawick are to be made safe after a town councillor expressed his concerns to a transport body. Councillor Davie Paterson, independent for Hawick and Hermitage, had contacted Amey over the stretch of pavements in Langlands Road, close to Langlands Bridge. A number of his constituents, particularly older folk, fear taking a tumble on broken paving stones. Now Amey has confirmed work will start next month to make the area safe. Mr Paterson said: “I am absolutely delighted that they have now listened to me as stretches of this pavement are extremely dangerous to the elderly and wheelchair users. I dread to think how they are able to negotiate this dangerous terrain. 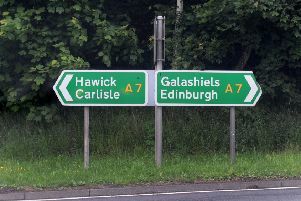 Garry Head, area manager for South/Highways with Amey, said: “The footway from Hawick towards Parkdail has a scheme in place to tidy it up which is programmed for March.” Delays in the work occurred as Amey or Scottish Borders Council debated which was responsible for maintenance of the area. But after the council formally informed Amey it did not accept responsibility for the land, the road infrastructure support service was able to contact Transport Scotland for finance to carry out repairs.